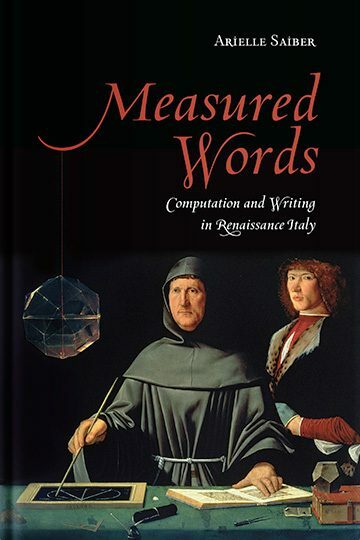 Measured Words investigates the rich commerce between computation and writing that proliferated in fifteenth- and sixteenth-century Italy. Arielle Saiber explores the relationship between number, shape, and the written word in the works of four exceptional thinkers: Leon Battista Alberti’s treatis on cryptography, Luca Pacioli’s ideal proportions for designing Roman capital letters, Niccolò Tartaglia’s poem embedding his solution to solving cubic equations, and Giambattista Della Porta’s curious study on the elements of geometric curves. Although they came from different social classes and practiced the mathematical and literary arts at differing levels of sophistication, they were all guided by a sense that there exist deep ontological and epistemological bonds between computational and verbal thinking and production. Their shared view that a network or continuity exists between the arts yielded extraordinary results. Through measuring their words, literally and figuratively, they are models of what the very best interdisciplinary work can offer us. Arielle Saiber has written an indispensable volume on a still overlooked aspect of the Italian Renaissance, namely the importance of the relationship of mathematics to the broadly literary aspects of Renaissance humanism. Richly illustrated, the book draws on Saiber’s meticulous study of the manuscripts and printed editions of these early mathematical work. From its arresting first sentence (‘There were computers in Renaissance Italy…’) to the final conclusion, the book grabs our attention, and Saiber herself, like the thinkers she writes about, both understands the mathematical complexities of her subject and is able to discuss them with admirable clarity and elegance. This is a major contribution to our knowledge of Renaissance mathematical writers.